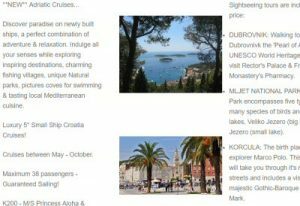 Any Adriatic cruise is bound to throw up a bounty of delights for those lucky enough to make the trip, if nothing else because Europe has so much to offer across the board. World class museums offer endless hours of entertainment and education, stunning beaches afford plenty of opportunities to top up the tan or while away a few hours reading a good book. Meanwhile the time has never been better to research restaurants that tickle your fancy on peer review sites, making the chances of finding that gem much more favourable. Cruises are becoming more and more attractive to an ever wider range of people and cruise companies are constantly updating their services and are more and more aware that they need to provide world-class service and make a great job of stopping at the best ports that are available. Here is my list of ten of the best ports that you might discover while on an Adriatic cruise. Ah, Venice, the city of romance and dreamy trips on a gondolier. The city where the exorbitant cost of an espresso is rendered insignificant by the views from Piazza San Marco! The city from which you can reach the island of Murano and watch age-old traditions of glass-blowing and maybe pick up some Murano ware that you’d previously only seen on an episode of Bargain Hunt! The biggest of the Greek Islands, Corfu serves as a fantastic cruise stop-off, with its olive oil and wine offerings. The architecture of its houses and castles date back to the Venetian epoch and have made Corfu a UNESCO World Heritage Site. With unparalleled views gazing over the azure seas of the Adriatic, Dubrovnik, which is another UNESCO site, must count as one of the most picturesque of the world’s walled cities, with marvellous beaches and restaurants also on its side. Valletta gives you one heck of a history lesson. You can explore the 16th-19th century era of the Knights of St John and the island’s 2nd World War history to boot. The cathedral is a Baroque masterpiece. Valletta is home to the Caffe Cordina, which has attracted visitors since 1837 and excels with its homemade pastries served in a beautiful edifice complete with vaulted ceiling. Stunning natural scenery surrounds the medieval port town of Kotor. It is the deepest natural fjord in the Mediterranean and the green water is made even more emerald by the surrounding vegetated mountains. The medieval town is charming and great to explore by foot. The pedestrian only old town is a wonderful place to spend a lazy afternoon, browsing and stopping for coffee or some soup (shrimp soup is a local speciality). Split itself grew outwards from the walls of Diocletian’s Palace, built by the Roman Emperor as a retirement home in 295 AD. It is the city’s main attraction. A large and modern port, which is quite unexpected, Ravenna is home to many attractions which make the UNESCO World Heritage list, including a 5th century mausoleum with breath-taking mosaics built by Roman empress Galla Palcidia. Koper is a lovely spot with plenty of choice for time spent during a port of call. The cathedral and bell tower offer a lot and Vinakoper gives you the opportunity to stock up on some fantastic wine at good prices. Often overlooked, Bari is a fascinating port town with an 11th century basilica to explore as well as some mouth-watering eateries. There is a walking tour of Bari’s street food, for the more adventurous! One of mainland Greece’s most stunning locations, Nafplion is no tourist resort, nor is it close to one. It boasts beautiful Turkish and Venetian architecture and the Greek meze at O Noulis is to die for.